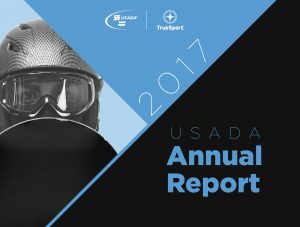 The USADA Annual Report provides an annual overview of the activities of the United States Anti-Doping Agency. The 2001 Annual Report covers USADA’s initial 15 months (October 2000 – December 2001), while the other annual reports cover USADA’s activities during those respective years. If you have questions, please e-mail us. The annual report includes a summary of the year’s important events and achievements as well as a full financial audit conducted by independent auditors. For USADA Annual Reports prior to 2016, please visit USADA’s website. This will redirect you from the UFC Anti-Doping Program pages. The U.S. Anti-Doping Agency staff and board of directors is pleased to share its annual report including a summary of the year’s important events, organizational accomplishments, and financial audit. This report reviews the events of the past year as they relate to USADA’s key areas of focus: Education, Science & Research, Testing, and Adjudication.